Boy, but WISGOP really knows how to pick their leaders. They have Scott Walker, the only sitting governor to have had a legal defense cooperation fund. Walker has also been shown to be, without reasonable doubt, to have been running his campaign through the Milwaukee County Courthouse, using county staff and equipment and money for his illegal politicking. And who could forget the infamous fake-Koch phone call? We have Scott Fitzgerald with his insatiable avarice for money and his very special friend/fundraiser. There is Robin Vos, who's lust for money is a pale comparison for his lust for married women (other than his own wife). Now that Scott Suder has slinked off to collect his thirty pieces of silver, WISGOP has outdone themselves again by electing State Representative Bill Kramer (R-Walkersha) to be their Assembly majority leader. But he also displayed a testiness bordering on anger over the frequent protests and interruptions from spectators in the gallery, including during the marathon 61-hour filibuster over the collective bargaining bill in 2011. Kramer was a strict enforcer of Assembly rules barring signs, cameras, clapping or other outbursts. Kramer also said he sometimes carries a concealed handgun onto the floor of the Assembly for his own personal safety. Yup, Little Big Man Kramer is so afraid that someone might take a picture of his bad side that he won't allow cameras in the gallery, but has no problem packing heat. The fact that he is allowed to have a gun at all, much less conceal carry, is alarming given his general state of inebriation. Kramer was the only lawmaker who applauded a line in Democratic Gov. Jim Doyle’s 2007 budget address mentioning that oil companies had made record profits. Doyle was using the line as part of his reason to raise taxes on the companies, but Kramer said profits were the state’s economic lifeblood. Oh, the greed is strong in this one! 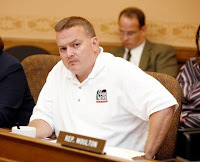 -- Assembly Republicans today elected Rep. Bill Kramer to be the next majority leader despite Rep. Chris Kapenga accusing his GOP colleague of displaying a pattern of inappropriate behavior that made him unfit to hold the No. 2 spot in the chamber. 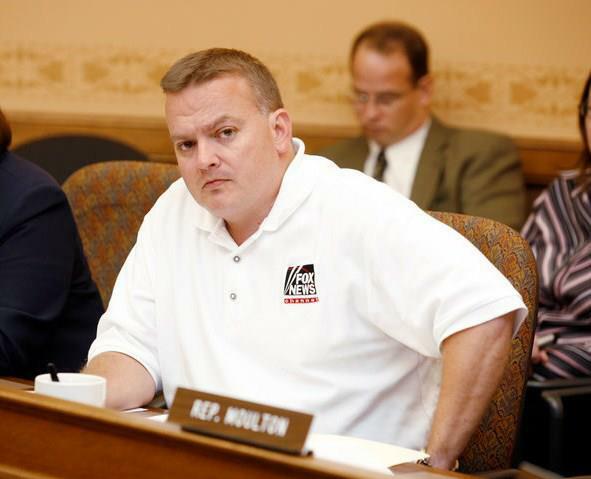 Kapenga, R-Delafield, made the allegation while giving one of the two nominating speeches for Rep. Dean Knudson for the post. He also charged there was an incident at an American Legislative Exchange Council event last month in Chicago. But he did not provide details in his speech and declined to provide specifics when he was approached by a reporter following the vote. Kramer acknowledged concerns about his sense of humor before his selection as speaker pro tempore, a spot he gave up to run for majority leader after Rep. Scott Suder left the post to take a job at the PSC. But Kramer said he proved he could be respectful on the floor and planned to do the same in his new role. After the vote, Knudson called for the caucus to come together. Knudson expressed confidence in Kramer working with Speaker Robin Vos, R-Rochester, on the GOP agenda of limited government, lower taxes and more prosperity. 2:33 mark – Miles recognizes a sloshy Represenative Kramer and calls to him with a megaphone. Bill Kramer is from conservative Waukesha and serves the 97th Assembly district. Arthur then does a brief interview with Kramer asking. Boy, aren't those just the qualities that everyone looks for in their leaders: Greed; misogyny; perversion; dishonesty; cowardice; bullying; and stupid enough to be a Faux Newz fan. *Isn't everything about ALEC inappropriate? **Former Sheboygan Mayor Bob Ryan must really being kicking himself now, wondering where he went wrong form the usual Republican path to greatness. Shameful. Kudos to Kapenga for trying to be the voice of reason. His contempt for the public and the democratic process is an affront to all of us. Kramer is a royal d-bag. Probably the most unprofessional person I've run across in a position of authority. But, that's about where the repugs are at these days. If you want to see Bill in all his glory go to the Nice Ash bar in DT Waukesha on a weekend. Get there early because he might be drooling on the bar after about 9:00.
most republican leaders are as bad as Kramer. the only thing they can do is prey on the ignorance of people.that and outside money is what gets them elected. Is Van Hollen A Paul Ryan Man? Why Jobs Can Not Be The Main Issue in 2014! When Is Follow The Constitution Day? UW Officials Are Badger Mad! Our Media Needs Your Help! Could Milwaukee County See Living Wage Proposal? Labor Day Bonus Caption This!